January is bringing snow to the Ozarks. It is bringing colder weather with it. That means the couple of inches of snow stays through the night and I could notice some snow colors at night. During the day snow is a bluish gray to dirty white, if the sky is clouded over. It turns a blinding white in the sun. I’d assumed it would be dark as the night is dark. Perhaps it is at new moon. As the moon approaches full, snow is not dark at night. It’s not only not dark, but glows in snow colors. 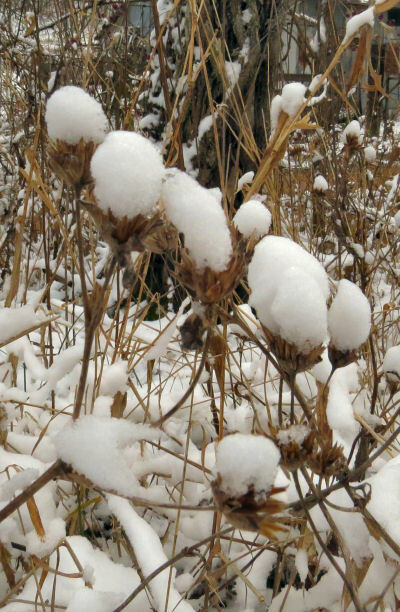 During the day elephant toe seed heads hold white snow caps. Once night falls the caps may be blue, if they are still there. I milk at night during the winter. There is a light at the house and lights in the barn. Some of the walk is done using a flashlight. One of the other additions to winter night milking is carrying buckets of water. It seems, no matter how many buckets I cart to the goats during the day, they are not enough. So I set buckets in the milk room for the goats to get a drink before going back in the barn. The snow fell early in the day. The clouds moved in to stay for days. Setting up for evening milking, I grabbed my flashlight and a bucket and started out of the barn. I put the flashlight back. White snow sets off the buckbrush berries during the day. 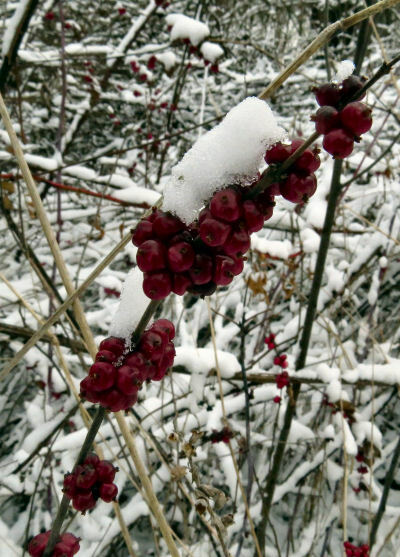 By nightfall the snow will be gone although the berries will still be waiting for a bird to come by to eat them. The snow was a blue glow across the ground. There weren’t any shadows, only this blue. It was bright enough to walk around without any additional light. The clouds held sway for another day just to spite the forecasters. Again I enjoyed walking in that blue glow on the snow. Finally the clouds began breaking up late the next day. This night I opened the barn door and the blue glow was gone. A whiter glow replaced it. If we get more snow near new moon, I will have to check out the snow colors at night then. Enjoy the views of “My Ozark Home” in my new book. This entry was posted in Ozark Hills and tagged seeing snow at night on January 23, 2019 by [email protected].